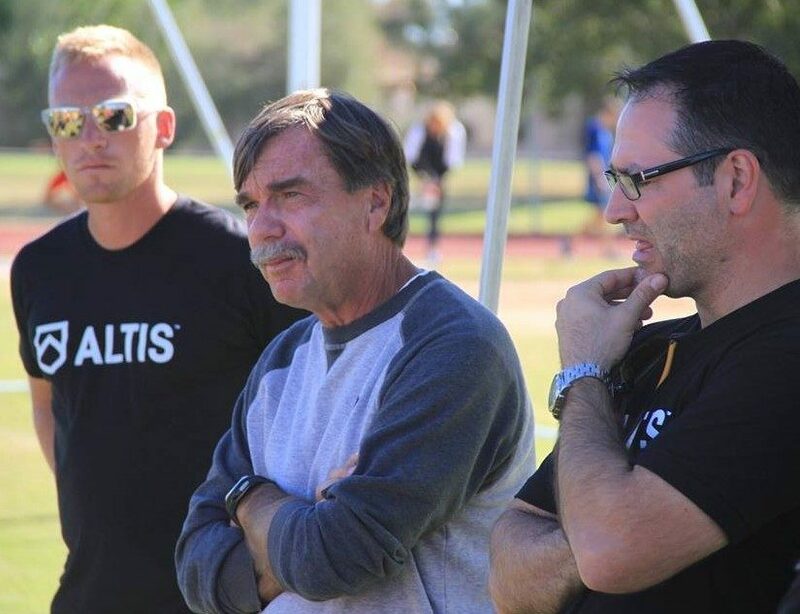 If you have followed the ALTIS Twitter feed and read Facebook posts or other articles in this blog-post series, you have likely seen the term “Performance Therapy,” with some description of how therapists are integrated into the training environment. But what is really meant by Performance Therapy? Is it a case of simply having treatment provided trackside, or is there a rationale or process by which the types and timings of inputs are governed? Performance Therapy began out of necessity. 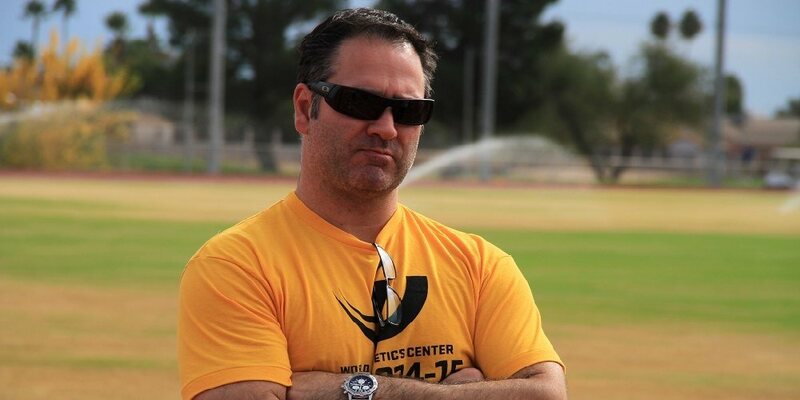 Coach Dan Pfaff, a teacher both at heart and by profession, has always promoted a daily focus on improving athlete movement patterns to progressively improve the athlete’s ability to demonstrate the skill of sprinting (or throwing, jumping, etc.). It is the focused, purposeful repetition of a skill that brings the skill to a stage of automation and ultimately transforms an individual from a novice to an expert performer who displays mastery across a variety of environments and conditions. Coach Pfaff initially worked at the high school level, with limited budgets and available services. He was responsible for programming, S&C, maintenance of facilities, and any other function needed to run a track and field program. This also included helping athletes manage nagging symptoms or injuries. A voracious reader, Pfaff used books to learn basic massage and gentle joint mobilization techniques, as well as PNF and other therapeutic modalities. Coach Pfaff observed very quickly that, as athletes improved their mechanics—helped by his brief inputs—performances improved and injuries resolved. This was the starting point of Performance Therapy. As it evolved over the years, and attracted a generation of therapists, it was not uncommon at the University of Texas to see Coach Pfaff educating visiting therapists on sprint mechanics. He contended that, if you understood the kinetic and kinematic models the athlete was working toward, you could recognize aberrations in movement patterns away from the model. Then, given a detailed knowledge of anatomy, you could determine which structures require attention in order to improve the observed movement pattern. Pioneers on this front, such as Dr. Mark Lindsay, D.C., and Dr. Mike Leahy, collaborated with Coach Pfaff, and the foundations of Performance Therapy were established. Its beginning corresponded with numerous world-class results, such as Donovan Bailey’s world-record 100m run at the Olympic Games in Atlanta. To improve performance, each member of the trinity must have a common understanding of the mechanical model the athlete is working toward. With a common understanding, communication becomes consistent and each member’s input is complementary to the desired goal. Within the trinity, any aspect dictating performance becomes a “currency” of communication and understanding. Mechanics, sleep hygiene, nutritional strategies, recovery strategies, etc., must all be actively understood and reinforced by all members, including the athlete. Athlete education in relation to each currency is essential so that each member is accountable for doing their part to ensure all efforts work to optimize outcomes. The daily observation of mechanics guides Performance Therapy input. Observation of the athlete’s movement begins the moment they walk from the parking lot to the track. Much can be gathered through observation. Mood, energy level, general posture, fatigue level, and gait fluidity are just a few of the qualities an attentive eye can capture—especially when this becomes a daily practice and a familiarity develops within the trinity. Obviously, accuracy of athlete reporting is of great value, but observation by the coach and the therapist are also important to help create a baseline behavioral profile of “normal” for that athlete. When observations fall outside normal, further investigation/questioning should follow—and this is just pre-session observation. Observation continues throughout the entirety of the session. With a shared model of event mechanics, and a knowledge of how each menu item in the training session is designed to contribute toward improvement of that skill, active observation is continuous from walking drills to dynamic drills and through to event-specific activity. Athletes at ALTIS have consistent components to their daily warm-up, including various drill and mobility progressions. This warm-up gives the therapist, coach, and athlete an opportunity to perform a daily “Living Movement Screen” through multiple planes of motion and thresholds of effort. The coach and therapist both observe movement quality while the athlete is actively noting kinesthetic findings. In this manner, aberrant or inefficient movements can be recognized. Specific intervention depends on the time of year, purpose of the session, etc., but can include coaching queues, a comment to refocus athlete attention, or a brief manual therapeutic intervention. The ongoing process employed is always: observe, treat, re-observe. The ultimate goal is to improve or maintain an athlete’s quality of motion throughout a session, from start to finish. When this occurs session after session, consistency of training is the result. Coach Pfaff states that training gaps are the biggest impediment to performance. Consistent, purposeful, high quality practice leads to mastery of a skill, and ultimately leads to consistent high level performance. Consistent, purposeful, high quality practice leads to mastery of a skill, and ultimately leads to consistent high level performance. One of the key components of performance therapy is immediacy. Immediacy refers to the capacity to provide an input in an attempt to improve movement quality and then have the athlete immediately return to the motor task. It is known that manual therapy can influence mechanical characteristics of movement such as range of motion and joint mobility. However, the transient increase in afferent input from the treatment input to higher cortical centers (somatosensory and motor cortices) is perhaps the greater influence, as it increases the athlete’s ability to incorporate the acquired/improved ranges into their movement pattern. Dr. Rick Celebrini states, “Manual therapy creates a transient window of increased proprioceptive awareness during which we can improve movement quality and motor patterning. If we are not taking advantage of this window, what are we doing?” It is my belief that, through daily focus and collaborative effort to improve movement mechanics, gradual improvements are made in skill expression that show as greater movement proficiency, resulting in improved mechanical efficiency. With improved proficiency and efficiency, we observe corresponding improvements in performance and a decrease in injury frequency. Current research is confirming the existence of a common mechanical model to accomplish maximal velocities, and this model is shared by the world’s fastest sprinters. Clark and Weyand stated in 2014: “We found that the fastest athletes all do the same thing to apply the greater forces needed to attain faster speeds…[and] our data indicate the fastest sprinters each have identified the same solution for maximizing speed, which strongly implies that when you put the physics and the biology together, there’s only one way to sprint really fast.” Similar conclusions have been made by others, including Dr. Ralph Mann and Dr. Frans Bosch. Dr. Deborah Sides, a biomechanist who was employed by UK Athletics in the period leading up to the London Summer Olympic Games, performed exhaustive research into the kinematics and kinetics of elite sprinting—providing detailed data of athletes traveling over 10 m/s—and determined the same thing. There are a number of characteristics identified as indicators or predictors of successful sprinting. To list and describe them all here is beyond the scope of this current article; however, some of these include maintenance of posture, maintenance of dorsiflexion through swing phase, degree of hip extension at toe off, height and duration of knee drive to the point of maximal hip flexion in swing phase, and positioning of the free leg in relation to the stance leg at mid stance, to list just a few. The evaluation of athlete performance against these and other key indicators is part of the observe, treat, re-observe process, always striving toward optimal. In living systems, there is a general rule that a biological system will search for the most energy-efficient solution to a task. Once an energy-efficient solution has been found, it repeats it. The convergence upon a common strategy to run fast is an example of this. Sprinting demands the delivery of large amounts of force over increasingly shorter periods of time. At maximal velocity, the ground contact time of world-class sprinters will be less than one-tenth of a second. In that time, they will produce forces three to five times their body weight on a single leg. Production of such force demands muscular effort, efficient production, and the return of elastic potential created within the fascial system, as well as the execution of precise timing and placement of these forces. It may seem obvious, but the execution of correct mechanics places the athlete’s anatomy (joints, ligaments, tendons, musculature, functional chains—the entire myofascial and musculoskeletal system) in the most advantaged position to accomplish this. Given the significance of the forces involved, it is not difficult to deduce that aberrant mechanics will increase an athlete’s risk for injury and reduce the ability to produce the necessary forces required for success. A joint complex not efficiently oriented (e.g., everted calcaneus, externally rotated femur, reduced thoracic rotation, etc.) acts as a weak point in the chain, bearing increased stress and potentially leading to injury at this or a related site. Through daily observation, it is our goal to recognize any potential “dysfunction” as it presents, and work to reduce its impact on performance, with the ultimate goal of correction. Performance Therapy is a part of ALTIS’s overall program. Performance Therapy is practiced in all training environments, from the track to the gym. It does not replace clinical work. It does not eliminate the need for proper S&C, or any other component of standard training and practice. 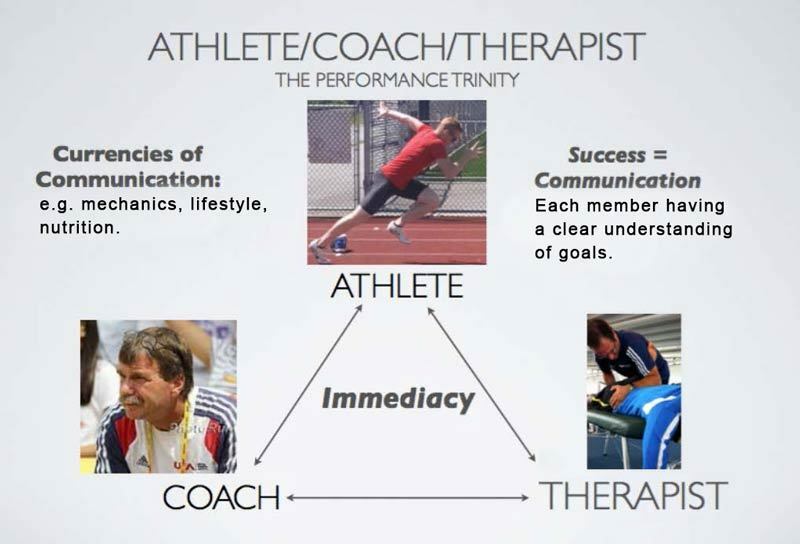 Instead, Performance Therapy is “an ongoing collaborative process involving Athlete, Coach and Therapist working to normalize function by integrating manual therapeutic intervention into the athlete’s sporting movement practice, resulting in performance improvement and injury reduction by focusing on and affecting technical proficiency and mechanical efficiency” (Pfaff, McMillan, & Ramogida, 2014). Clark, K. P., and P. G. Weyand. “Are Running Speeds Maximized with Simple-spring Stance Mechanics?” Journal of Applied Physiology 117.6 (2014): 604-15. Web. Sides, D. L., Kinematics and kinetics of maximal velocity sprinting and specificity of training in elite athletes, PhD thesis, 2015, University of Salford.